Archbishop Damaskinos Papandreou was born Dimitrios Papandreou in Dorvitsa, Greece in 1890. He enlisted in the Greek army during the Balkan Wars. Ordained a priest of the Greek Orthodox Church in 1917, he was appointed archbishop of Athens in 1941. During the Holocaust, Archbishop Damaskinos and Athens police chief Angelos Evert saved thousands of Greek Jews. Although an estimated 87% of the nation’s Jewish population — 60,000 to 70,000 Greek Jews — perished during the Holocaust, 10,000 survived, largely due to the Greek people’s refusal to cooperate with German plans for deportations. With the arrival of the Axis occupation, deportations from cities like the northern port of Thessaloniki proceeded at a rapid pace. Many Jews fleeing persecution in the north found a safe haven in Athens. On September 20, 1943, Dieter Wisliceny — a deputy of Adolph Eichmann, the administrator of the Nazi Final Solution — arrived in Athens. Wisliceny ordered Chief Rabbi Elias Barzilai to appear before him, to provide accurate figures about the Jewish population in Athens and to create a Judernat. Made up of Jews who were coerced into joining, a Judernat made compliant Jews ”responsible” for keeping law and order in a Jewish community, and used them as a liaison between the German authorities and the Jewish population. Wisliceny ordered Barzilai to provide the names and address of all members of Athens’ Jewish community, the names of all foreign Jews living in the area, the names of Italian Jews in Athens, and the names of those who had assisted Jews who had escaped to Palestine. He also commanded Barzilai to compile a list of individuals willing to serve on a new council — of which Barzilai was to be president — that would create a Jewish police force to carry out Nazi demands; and unveiled plans to create identity cards for all of Athens’ Jewish population. Shaken by his encounter with the Nazi commander, the Rabbi contacted Archbishop Damaskinos and told him about the meeting. Since Damaskinos knew what had taken place in the north, he suggested that the entire Jewish community should take flight, because it couldn’t be protected. Rabbi Barzilai asked the Germans for more time to compose the requested lists, and then, after meeting with other leaders of the Jewish community, he destroyed the community records and advised the Jewish people to flee. A few days later, the Rabbi himself left the capital and joined the resistance. The Church of Greece, under Damaskinos’ leadership, condemned Hitler’s plans for the country and instructed priests to announce its position in their sermons. Jew had participated freely with other Greeks in all walks of life for 2,300 years, co-existing in harmony with their Orthodox countrymen, contributing good work in numerous fields. Jews had lived in Athens since the time of Alexander the Great, in the mid-fourth century, many having sought sanctuary in Greece after having been expelled from Spain in 1492. During the Holocaust, the Greek Jewish population was almost completely destroyed. As they prepared to implement the deportation and mass murder of their Final Solution, the Nazis compiled intelligence reports about the Jewish population of Athens. They chose important Jewish holidays for their monstrous acts, beginning with an order on the eve of Yom Kippur, signed by the German military commander in Athens, S.S. General Jurgen Stroop, which organized the city’s Jewish community under Nazi supervision. The Jewish population in Athens had increased since the outbreak of the war. Damaskinos’ and the Rabbi’s work had transformed the city in a safe refuge. Since many of the newly arrived Jews had no fixed place of residence, German intelligence about the Jewish population was often wrong. Under the order issued by Stroop, Jews were commanded to appear at community offices within five days to declare their residences and register their names. Despite the threat of dire consequences for failing to appear, only 200 showed up. In a similar instance, the German authorities announced that they were planning to bring a special flour to Athens for Passover, so the Jewish population could prepare matzoh — provided they were willing to reveal themselves and register with the authorities. Although the false act of kindness tempted some, many more Jews registered because they were afraid the Nazis would enact reprisals on their Christian neighbors, who had been shielding them from the persecution. When the Germans started rounding up Jews, over 600 Greek Orthodox priests were arrested and deported because of their actions in helping Jews, and many Jews were saved by the Greek police, the clergy and the resistance. Damaskinos and Evert faced the threat of death for their efforts, and would surely been killed if the extent of their assistance had become known to the Germans. There were several means of escape. Many left by boat from Oropos in Attica, where they were frequently force to pay enormous fees for a three week journey to Turkey. Some young men without families escaped to partisan camps in the mountains. False baptismal certificate and new identity papers from the Greek Orthodox Church could also help a desperate fleeing Jew. Archbishop Damaskinos oversaw the creation of several thousand such certificates, and Athens police chief Evert provided more than 27,000 false identify papers to desperate Jews seeking protection from the Nazis. The Archbishop also ordered monasteries and convents in Athens to shelter Jews, and urged his priests to ask their congregations to hide the Jews in their homes. As a result, more than 250 Jewish children were hidden by Orthodox clergy alone. When all official appeals to stop the deportations failed, Archbishop Damaskinos spearheaded a direct appeal to the Germans, in the form of a letter composed by the famous Greek poet Angelos Sikelianos and signed by prominent Greek citizens, in a bold attempt to appeal to the hearts and minds of the occupying authorities, in defense of the Jews who were being persecuted. The letter incited the rage of the Nazi general Stroop, who threatened the Archbishop with death by a firing squad. Damaskinos’ response was, ”Greek religious leaders are not shot, they are hanged. I request that you respect this custom.” The simple courage of the religious leader’s reply caught the Nazi commander off guard, and his life was spared. During World War II, Greece lost 580,000 of its pre-war population of 6.5 million, and an additional 100,000 Greeks were wounded in the fighting. Ordinary Greeks put themselves in mortal danger, protesting against the occupation authorities. In the case of Athens’ Jewish population, assimilation and a strong resistance movement helped at least some Jewish Greeks to survive the Nazi onslaught. Five thousand Jews remain in Athens, helping to rebuild Jewish life in post-war Greece. The Greek government sees Jewish heritage as part of the country’s national heritage, and has refurbished the Jewish Museum of Greece in Athens. An honored site among the nation’s many historic treasures, the oldest synagogue site in Greece is a ruin from the Fifth Century B.C.E., located in Athens’ ancient marketplace, the agora at the foot of the Acropolis. After the war, Archbishop Damaskinos served as regent of Greece until King Georgios II returned from exile. 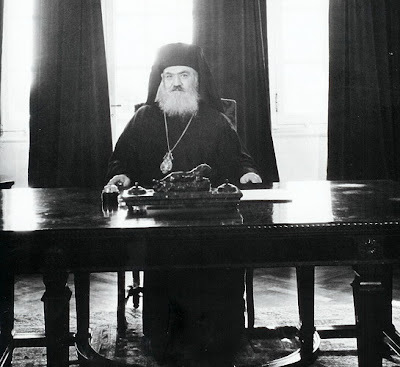 When fighting broke out between pro-royalist Greek soldiers and communist partisans in 1945, the Archbishop was appointed Prime Minister. He called for peace and order in the country. He relinquished his leadership position when the king was formally recalled in 1946. 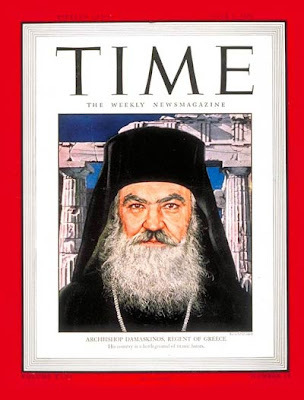 Archbishop Damaskinos died in Athens on May 20, 1949.